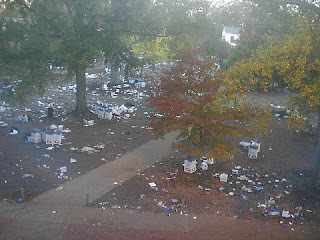 Athens World: Treating the campus with respect???? As someone who works in the department that hands out the trash bags and puts out the trash cans and places huge arse dumpsters with signs that say "tailgate trash HERE," it makes me really, really upset to see that people are so irresponsible and so drunk that they can't take a couple of extra seconds to clean up after themselves. Aside from the trash, it wrecks the grass that the grounds crew works so hard on year round.